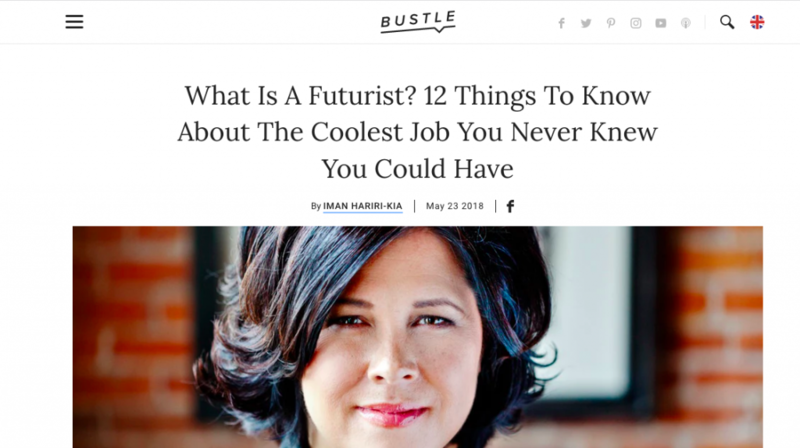 Apparently, being a futurist is one of the coolest jobs on the planet. Shame I’m in the process of getting out of being one then. Am I just way ahead of everyone else or seriously behind? (Personally, I think futurists come and go. They come in and out of fashion and at the moment we’re at peak futurist (or, at least, futurists have reached the peak of inflated expectations). -Firstly, the article, in Bustle. Not bad, but it’s really describing trend spotters not futurists in my opinion. Real futurists are much closer to sci-fi writers in my view. They tend to think at least 10-20 years out, not next year, and they don’t predict either. OK, maybe they do, for fun, but “based on stone cold facts”? How can you have stone cold facts about the future when the future hasn’t happened yet? What is being described here is extrapolation from historical data or current trends (“future trends” is another oxymoron btw – guilty!). I think futurists, like good sci-fi writers, warn of possible dangers or at least illuminate current concerns. They point to worlds that might be rather than world’s that are, and again this is rarely trend-based and is impossible to ‘prove’ with numbers. In other words they get people to think. Also, just look at the history of bad predictions from futurists. The accuracy of forecasting is shocking, although I’m sure it’s not stopping. So here’s a prediction: One thing that won’t change in the future is our interest in the future – what’s coming next. But something else that won’t change is our total inability to remember people that, with hindsight, make shockingly incorrect statements. Thanks to Tara for spotting this article. Link to article here. This entry was posted in Futurists. Bookmark the permalink.